Musical improviser for silent cinema, a caring professor, and a great fan of sports… Here are 10 small things to better understand the author of Lady Macbeth of the Mtsensk District and the "Leningrad" Symphony. Dmitri Shostakovich was only ten years old when the Russian Revolution first broke out. A child of the Soviet era, he was forced to abide by the rules. The Party demanded that music be clear, tonal, and intelligible. No room for musical experimentation and anything resembling "formalism". Shostakovich obeyed, to a certain extent. In turn praised and censored by the Stalin regime, the composer spent his career in fear. He did not approve of Soviet politics, but was forced to keep quiet. And what he was unable to express through words, he expressed through his music. A music at times lyrical, sometimes ironic, biting, and even mocking. Though the symphonic genre dominated his early works, Shostakovich gradually turned to other, more refined genres, such as the string quartet. One more! Young prodigies amongst composers are not lacking in numbers. With a music-loving father and a pianist mother, the musical career of the young Dmitri was off to a good start. He was barely ten years old when he finished his first composition, a musical poem entitled The Soldier. At the age of thirteen, he joined the Petrograd Conservatoire (today in Saint-Petersburg), and begin studying composition with Maximilian Steinberg. Alexandre Glazounov, the conservatoire's director, was impressed by the young man's talents, going so far as to consider him as "one of the greatest hopes of our art". He took the young musician under his wing, and managed to obtain a bursary for him when his financial situation became problematic. In the Shostakovich family, the choice was between only two disciplines: science or music. The father was chemical engineer, and the mother was a pianist. The eldest, Maria, began studying the piano at the age of nine under the watchful eye of her mother. She later chose to pursue a career in music and became a professor at the Leningrad Conservatoire and School of Choreography (today Saint-Petersburg). A second success for Mrs Shostakovich: her son Dmitri. Pianist, composer… his career is well known. However, the musical matriarch failed to transform her youngest daughter Zoïa into a piano virtuoso. Instead she chose to become...a veterinarian. Science or music, the choice between the two subjects was upheld for the following generation. In the early 1930s, Shostakovich married astrophysicist Nina Varzar. Together they had two children: Galina, future scientist, and Maxime, a promising pianist to whom his father dedicated his Piano Concerto no.2, first performed in 1957 by the young son in question on his 19th birthday. In 1922, the young Dmitri lost his father. He was now the man of the house. Times were hard for the family, and debts were accumulating. In order to provide for his mother and sisters, he found employment as a cinema musician in 1923. His job was to accompany the silent films that were projected on the screen. Good reflexes were required since this was entirely improvised! Without much conviction, he worked at the "Bright Reel", the "Splendid Palace", and the "Piccadilly". These establishments were in poor shape and the pay was miserable: barely enough to buy a pair of boots and gloves! His inspiration was "paralysed", unable to compose a single line, writes his biographer Krzysztof Meyer. He later returned to the world of cinema but this time as a film music composer, working for a variety of films including New Babylon, The Fall of Berlin and Hamlet. Many of these films were conceived primarily with the propaganda of the Soviet regime in mind. Aside from being a composer, one must not forget that Shostakovich was a brilliant pianist. At the end of his studies at the Conservatoire, an important question arose: pianist or composer? He received his piano diploma in 1923, at the age of 17. Four years later, he took part in the famous international piano competition, the Chopin Competition in Warsaw. Though he did not win first prize, his piano technique did not go unnoticed. His bright technique, impeccable rhythm, and well-measured lyricism impressed many audience and jury members. However, an unfortunate event cast a dark shadow over the composer's later years. In 1958, an early indication of paralysis manifested itself and playing the piano became a difficult task. Shostakovich was even forced to abandon the performance of certain works at the 3rd Warsaw Autumn festival in 1959. The diagnosis? Poliomyelitis, a chronic illness affecting the composer's spinal fluid. Shostakovich and sport, what a story! A great fan of football, the composer often attended matches of the two big clubs in Leningrad, "Dynamo" and "Zenith", and noted with care the match scores in a little notebook. He even composed a "football ballet" entitled The Golden Age. It was even through sport that the composer met his first wife, Nina Varzar. It was in 1927, and Shostakovich was staying in Dietskoïe Zielo when he noticed three young women playing tennis. Three sisters to be precise: Irina, Loudmila and… Nina. Naturally, this was not the last time they would see each other. Nina was already a talented pianist, but also a student of mathematics and physics, and much like Shostakovich, she enjoyed sports, in particular ice skating and alpine climbing. The two tied the knot in 1932, "without saying a word to anyone", as recounts Krzysztof Meyer. For Shostakovich, teaching was not merely an easy income but a real pleasure. He began teaching in the early 1940s, in Leningrad. He always arrived before his students, and always took the time to welcome each one individually. He never followed a precise method of teaching, but rather adapted his teaching to the needs of each of his students. He was never absent and if ever he was obliged to cut a lesson short, he always warned his students in advance. To make his lessons easier, he painstakingly transcribed the works of other composers, such as the Symphony of Psalms by Stravinsky for piano. Deeply invested in his work as a teacher, he often put his students in touch with the Composer's Union, and when it was necessary for one of his convalescent students to return to Crimea, Shostakovich quickly found the necessary finances to help the student. Symphony no.7, what an adventure! 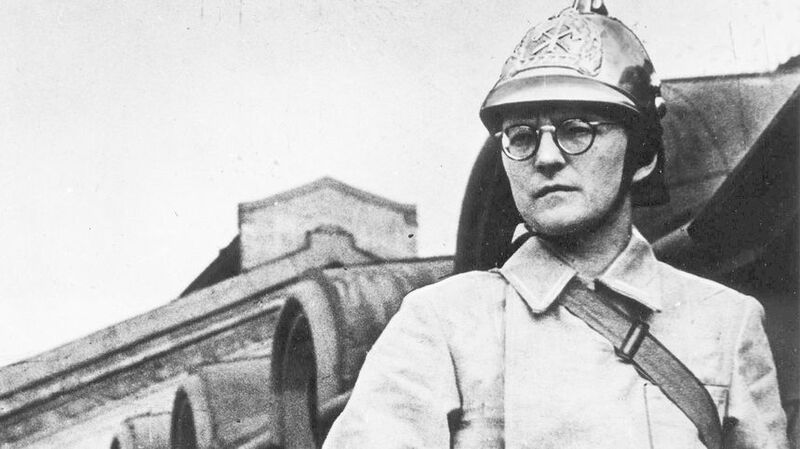 During the siege of Leningrad in 1941, Shostakovich was keen to join the many volunteers. After several rejections, he was finally assigned to the fire brigade (as seen in the famous picture of him wearing a fireman's uniform). However, the composer was most useful for the regime at his desk, creating new musical works. His Symphony n°7, subtitled "Leningrad", was composed under an incessant enemy bombardment. It only took two months for Shostakovich to compose the first three movements. During the first private performance of the work, an air raid siren was suddenly set off. Whilst his family ran to the nearest shelter, the composer remained to continue the performance for the remaining public. The symphony was never conceived as a work in contribution to the war effort. As the composer himself explained, he sought instead to bear witness through music to the events that surrounded him. The symphony encountered a resounding success, and both England and the United States wished to welcome the work in their concert halls! According to Michel R. Hofmann, the work passed through Tehran and Cairo before eventually arriving in the United States. A veritable expedition! Lady Macbeth de Mzensk is Shostakovich's second opera after The Nose. It tells the story of Katerina Ismaïlova, a young woman mourning her failed marriage. She soon falls in love with one of her husband's employees. Adultery, murder, and betrayal soon follow, until the heroine's suicide. First performed in 1934, the opera received an enthusiastic support from the public following its initial performances. So much support that, according to Detlef Gojowy, it was not uncommon to hear certain excerpts of the work being played in various factories! However, in January 1936, the axe finally fell. An article published in the Pravda, the Party's official newspaper, violently criticised Shostakovich and his opera Lady Macbeth. The reason? Stalin disapproved of the work. Its subject was coarse and almost "pornographic", and the music "discordant". The title of the article, "Muddle instead of music", came from the dictator himself. "Racket", "grinding", "cacophonous", "noisy", these were the words used to describe the opera. After numerous alterations, the work was finally performed again almost 30 years later, in 1962, with the new title Katerina Ismaïlova. As official composer for the regime, Shostakovich was forced to conform to the party line and create an intelligible music suitable for the masses. The composer obeyed. But this did not prevent him from concealing a great layer of irony within his works! Shostakovich's revolt and disgust was concealed and held within, as all his biographers reveal, including Bertrand Dermoncourt and André Lischke. The latter speaks of "a hellish duality". Though the composer appeared docile and discreet on the outside, he was bubbling with anger within. One need only look at the Symphony no.5. At first glance, the work corresponds to the type of music requested by the Soviet party. Melodic and transparent. In reality, however, the composer's music is almost a parody. The perfect apologist for the regime, crushed by its own official policy. Similarly, from the Symphony no.10 onwards, Shostakovich began signing his works with the initials DSCH (D, E flat, C, and B in German notation). This detail is particularly clear in the String Quartet no.8, whose opening motif is built using these four letters. A discrete and shy man, this is how the composer is described by his biographers. He waved with a sense almost of embarrassment, hid behind thick glasses and a seemingly "collegian" appearance, according to Michel R. Hofmann. However, Shostakovich was an extremely respectful man. Following the Pravda affair, he feared he would be arrested at any moment. Wishing to spare his family the sight of such an act, he often left his apartment, carrying a suitcase. He would thus stand for hours facing the elevator, waiting. Similarly, following his second heart attack, he would go out of his way to cordially welcome any and all of his visitors. Though doctors strongly advised that he avoid any physical effort so as to avoid getting tired, "he welcomed each visitor […] making a huge effort to lift himself up from his cushions and sit upright», writes Krzysztof Meyer.